Freshly made steamed buns for breakfast on the street. These past two weeks I was fortunate to participate in a group field study in rural Yunnan Province, located in Southwestern China. 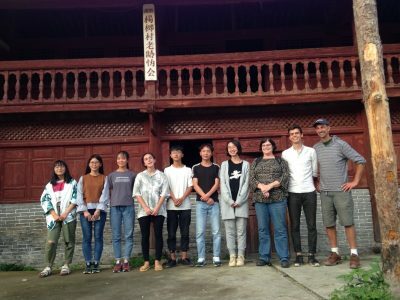 Professors Ann Hill (Anthropology) and Susan Rose (Sociology) and six motivated students co-wrote a grant funded by the Freeman Foundation to study cultural changes in a rural Chinese village in response to economic development. They were kind enough to bring me along to help build connections with village farmers and to contribute my perspective to the field study. Having visited the same province with Professor Hill in 2013, I jumped at the chance to see some old friends and make new ones, all the while deepening my understanding of agricultural systems in rural China. Yunnan Province is located east of Tibet, north of Myanmar, Laos and Vietnam, and south and west of the rest of China. The landscape is mountainous, green, moist, and culturally diverse, with 25 unique ethnic groups based out of the province. Our trip began in Kunming (the largest city in Yunnan), but we spent most of our time in Fengyu, a village of about 8000 people located about two hours from the small city of Dali. Most of the people living in Fengyu are of the Bai ethnic minority – while the educated younger generations speak Mandarin Chinese and wear modern clothes, many senior citizens speak only Bai language and dress in traditional outfits. 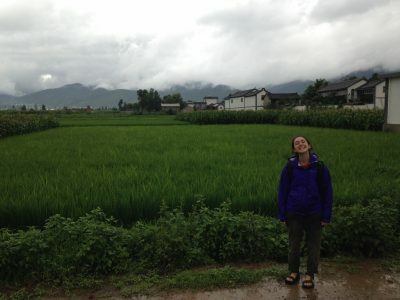 Rachel Gross ’19 appreciates some polyculture of rice and corn growing between houses. First let me say that the spirit of hospitality from Chinese citizens towards western visitors is unmatched by anything we might encounter at home. The people of Fengyu welcomed us into their homes with genuine interest and friendliness, and we were often greeted enthusiastically by strangers on the street. Our hosts were also generous with gifts, food, and their time. This experience left me inspired share the same welcoming spirit with foreigners I meet here in the US in the future. 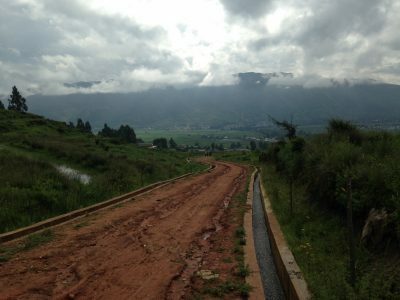 Concrete channels minimize erosion and facilitate irrigation around mountainous Fengyu Village. Farming in small villages in China is largely done by people working with hand tools and little to no machinery. While this is certainly more labor intensive than the tractor based farming system we’re used to at home, human powered agriculture permits many sustainable aspects that are environmentally and socially beneficial. Hand labor allows farming on strips and scraps of land that are too small or too steep for tractors, thus the people of Fengyu are able to take maximum advantage of all the farmland available for food production. We regularly saw corn, beans, rice and other crops planted in small patches between houses (what we would think of as our “yard” in the USA). Hand-worked plots also permit mixing of many crops in a small space (known as polyculture) which enables the farmers to reduce use of outside inputs for fertility and pest management. It was common to see corn and beans planted together, and we also saw widely spaced corn serving as tall stakes to support a pepper trellis. Hand-worked fields enable the farmers to apply their care to every square foot of the landscape, and the results were impressive. Most fields we observed were full of tall, evenly spaced, healthy crops with relatively low weed pressure. On evening walks we were also happy to hear abundant populations of frogs frequenting the fields, which is a good indicator of low levels of pesticide pollution. Hand powered farming also uses little to no fossil fuels. We often saw elderly farmers hauling large basket-loads of hand harvested forage towards home on their backs. Several houses we visited kept one dairy cow in their courtyards for household milk production. 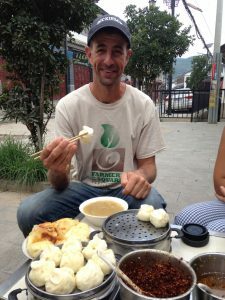 While field corn, sweet corn, rice, and blueberries dominated the farming landscape around Fengyu, the local diet was highly diverse and always interesting. In addition to staples and a wide variety of vegetables, offerings at the huge local farmers’ market included many varieties of wild harvested mushrooms, local tea, home-made tofu, fresh and aged chicken eggs, walnuts, spices, live fish and poultry, and butchered sheep and pork. We met many excellent cooks in Fengyu, serving up dishes as varied as steamed buns made on the street, dumpling soup, sliced pig ear, raw pork, sautéed wild mushrooms, and braised loach fish. 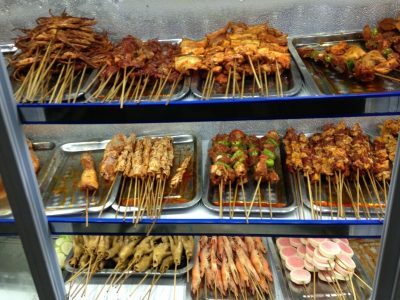 Our favorite spot for late night street food was a barbecue stand that offered just about everything you could imagine on a stick – topped with spicy sauce and grilled to perfection. Pork, veggies, chicken feet, shrimp and more ready for grilling at the street barbecue. The local and regional government around Fengyu has invested in sound public works projects that demonstrate an interest in environmental sustainability. Rainwater (there was a lot when we were there) is channeled throughout the town in a network of concrete gutters and channels. These help to reduce soil and road erosion, while also making water conveniently available for irrigation in the surrounding farm fields. Roads were in great shape, and the completion of a local sewage treatment plant last year greatly increased sanitation and quality of life while reducing pollution of a large lake downstream. 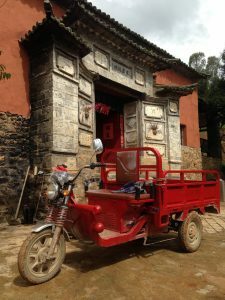 The use of small electric vehicles is widespread in China, and I became so enamored with a commonly used three wheeled electric farm cart that I decided to bring home some parts in my suitcase and try to build one for the College Farm! All of the local youth in this photo grew up on a farm but plan to attend University and seek professional jobs. They hosted us for a fun game of basketball and cultural exchange. I’ll wrap up this report by expressing my gratitude to Professors Hill and Rose and the College for facilitating my participation in this study trip. It was a rare opportunity to visit a remote town, unspoiled by tourism and thus full of genuine rural people living true to their local culture. China is a fascinating country, full of beauty, contradictions, and changes. The language is difficult but approachable. The pace of development there is staggering – I suspect that Fengyu and its surroundings will look quite different if I am lucky enough to visit again a few years in the future. Finally, I’m grateful to Jenn, Duane, the interns and farm students who covered my responsibilities while I sneaked off to China. It was a refreshing, rewarding and worthwhile trip! One Response to "Field Notes from Matt Steiman"
Wow! Really enjoyed reading your blog, Matt!